While there haven't been many big events this week, there were definitely some memorable ones. On Sunday, our whole crew drove out to Wolf Point, where both the choir and the band performed at Community Bible Church. The church graciously invited us to their Harvest Festival meal afterwards, which was delicious! We did some shopping in town and then headed back to the dorm. A few hours later, we jumped back into the white van and headed toward Bill and Trisha Reddig's house for a fun night of games and pizza. A GREAT time! Right away when we got there, most of the students headed downstairs to play pingpong while Trisha got the pizzas baking. 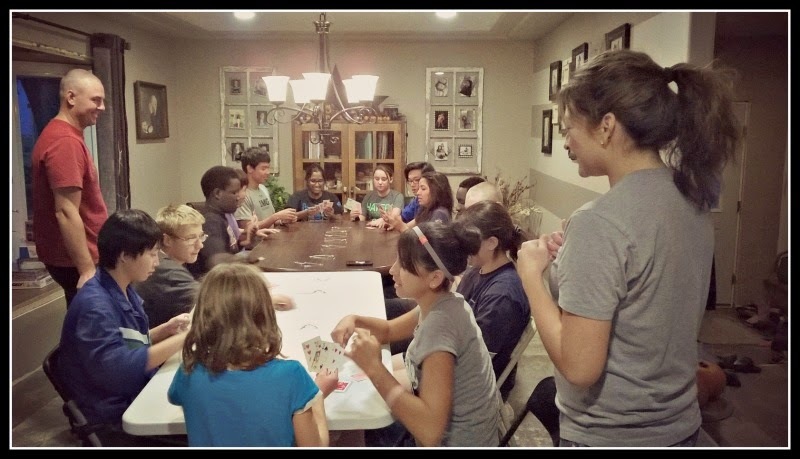 After some delicious food, several of our crew gathered around to play a mean game of Spoons (pictured above). Of course, the room filled with shouts and laughter. Here's a short clip to share our experience with you. :) Keep your eyes on Dimon. She's sneaky! ;) Poor Aleyna didn't quite grab fast enough, even though there was an extra spoon on the table. Ibrahim grabbed that one really fast! Whoops! In many ways, the rest of the week has carried on pretty ordinarily. This weekend, the girls head out to homes in the community for Girl's Dorm Weekend Out. The guys will be ruling the roost around here until Sunday evening. I'm sure they will create many great memories. In taking advantage of a short post, can I share with you a few creative ways in how you could take part in loving our dorm, in making us part of your own? 1. Pray for us by name. It's been said that "prayer moves the hand of God, and the hand of God moves the world." Please pray God's hand would move in our world? 2. Write the students encouraging notes. Remind them that they are awesomely made, incredibly loved, warmly welcomed to just be who they are in this community. "Grace to be and room to become." Written words mean SO MUCH! 3. Invite the crew over for a game or movie night. While some are great at hosting our 15 crew, if it's overwhelming, maybe hosting the guys or girls separately would be more your thing. We don't require much, but it sure is a sweet thing to have others in the community intentionally welcoming our group into their homes and lives. "It takes a village to raise a [teenager]." And you may just have a special place in their lives that the RA's don't have because of their unique position and title. We need each other! We are always blessed by extra food dropped off, whether that's a pan of brownies or extra vegetables, we're always so grateful! 5. Allow us to teach you something new. A lot of us come from very different backgrounds, and we don't quite fit in this unique culture. Please allow us room to make mistakes and to be our own unique selves with our unique pasts, struggles, and talents. We will need your grace and loving appreciation. These students know things that this community could benefit from hugely. What a gift to learn from them! 6. Come to the girls' volleyball games. Sadly, the girls don't get a lot of cheering with volleyball, but we have some incredible players! Come watch! Our next game is today at 6pm. See you in the gym? 7. Connect one-on-one with us. If you're reading this as an alumni, what would you like to add? What made you feel loved and significant while you lived in the dorm? Please leave us a comment! We would love to hear!